Tu-214ON was intended to replace outdated Tu-154 and An-30 aircraft [which remained in service as of early 2016]. 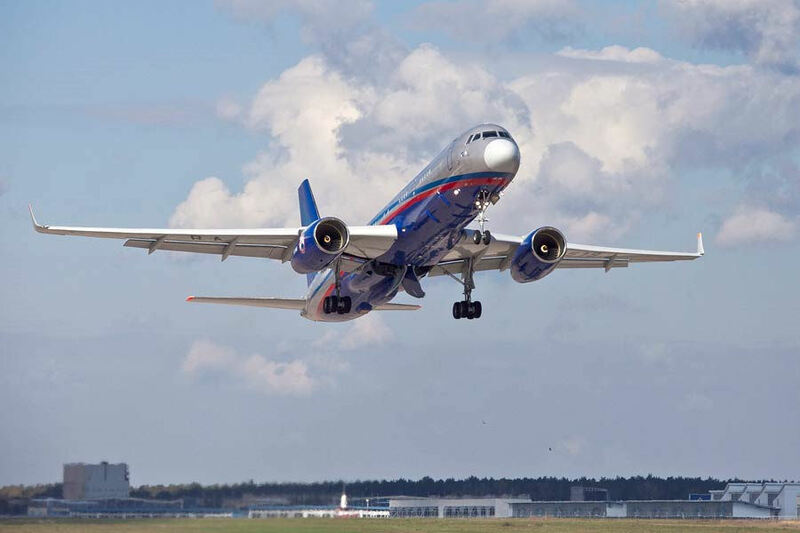 This airframe will augment or replace aging Tu-154M which supports two critical missions, the Russian Cosmonaut Training Program and the Open Skies Treaty. 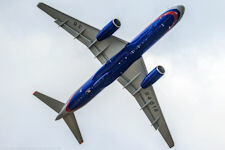 This new aircraft could be equipped with the full sensor suite allowed by the treaty which includes special digital photo cameras, video, infrared line scanning device and sideways-looking synthetic aperture radar for aerial photography and can transport the New Strategic Arms Reduction Treaty on site inspection teams to declared U.S. points of entries. 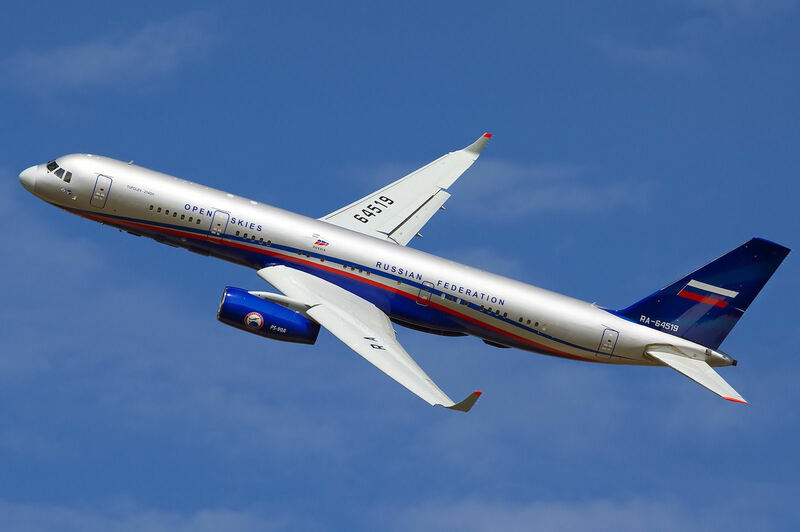 The first copy of the special-purpose aircraft (legal air reconnaissance) Tu-214ON "Open Skies", developed by the design bureau of the holding "Tupolev", built at the Kazan plant in May 2011 commissioned by Radio Engineering Corporation "Vega". June 1, 2011 the plane made its first test flight in Kazan. 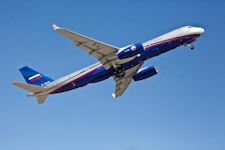 Test pilots "Tupolev" company carried out 24 test flights and praised. Then the ship began preparing for certification testing, which started in early 2012. On the stocks KAPO Gorbunov was building another similar aircraft. The aircraft is designed for inspection flights over the territories of the States Parties to the Treaty on "Open Skies". It monitors from the air how other countries are carried out the most important points of international agreements, including in the field of armaments. The agreement on "open skies" was adopted by the 27 OSCE participating States in 1992. The agreement opened the airspace above them to control in order to maintain peace. Now it is an international agreement involving 34 countries. The Open Skies Treaty was signed March 24, 1992, in Helsinki by representatives of 23 OSCE member states. The purpose of the agreement is to strengthen trust between the countries by improving mechanisms for monitoring military activities. The document establishes an “open skies” regime that allows participants the opportunity to conduct aerial surveys of each other’s territory. Before that, on February 19, 1988, a center was established to ensure the implementation of arms reduction agreements by the Russian Air Force. Currently it consists of its leadership and three departments, all of which are subject to the commander of the Air Force. Since 2010 the center has been directed by Russian groups that support the foreign missions that come to Russia under the Open Skies Treaty. Observation flights over the territory of the Russian Federation are carried out on OC-135B, C-130, SAAB-340B, CN-235, AN-30, and AN-26 airplanes. AN-30B-154 and Tu-154M LK1 aircraft are used for missions over the territory of other treaty participants. The Open Skies Treaty permits each of the 34 participating states to conduct short-notice, unarmed observation flights over the territories of its signatories. The treaty is designed to enhance mutual understanding and confidence by giving all participants, regardless of size, a direct role in gathering information through aerial imaging on military forces and activities of concern to them. Open Skies is one of the most wide-ranging international arms control efforts to date to promote openness and transparency in military forces and activities. demonstration flights as well as flights to collect data in preparation for the aircraft carrier inspection and certification of the aircraft. Tu-214ON is equipped with onboard surveillance system developed by the radio engineering company Vega. The system is designed to produce images of the countryside, record the submissions received, document all incoming information and surveillance, and monitor and manage navigation data for the surveillance analysis. The radio engineering company Vega was created in 2004 to ensure the priority development of key radio, radar, reconnaissance, ground control, aviation, and space-based technological systems for defense and economical interests. In January 2014, based on a proposal from the government of the Russian Federation, 100% of the company’s shares were transferred to the state corporation Rostec. Tu-214ON equipped modern complex BKAN (onboard complex aviation surveillance), which allows to monitor compliance with arms control agreements. The structure includes BKAN aerial cameras, TV and infrared cameras, radar side-looking synthetic aperture. According to the arrangement resolution aerial camera and the TV camera is 30 centimeters for side-scan radar - three meters, IR cameras - 50 cm. The heart of the aircraft is a complex aircraft observations (BKAN), which was created by the specialists of the concern "Vega". This complex is designed for reconnaissance imaging area, record and document information, control on-board means of observation and creation of navigation information for the surveillance equipment. The structure BKAN included panoramic and framing aerofotoapparatura, infrared and television cameras, as well as side-looking radar. According to international agreements resolution TV cameras and photographic equipment is 30 cm, for the IR camera - 50 cm for the side-looking radar - 3 m. Aerofotokompleks mounted in the forward fuselage of the aircraft on its lower deck. Radar capture band is from 4.7 to 25 km, and the viewing area - up to 50 km. Infrared observation equipment was located in the center section of the Tu-214ON. Its viewing angles of 130 degrees, and the width of the scanning area of the strip 4,6h (h - is the height of the airplane on the radio altimeter). After completion of the flight, all the information obtained with the help of ground-based instrumentation and data acquisition processing translates into one digital format that has been adopted by all states parties to the OST. 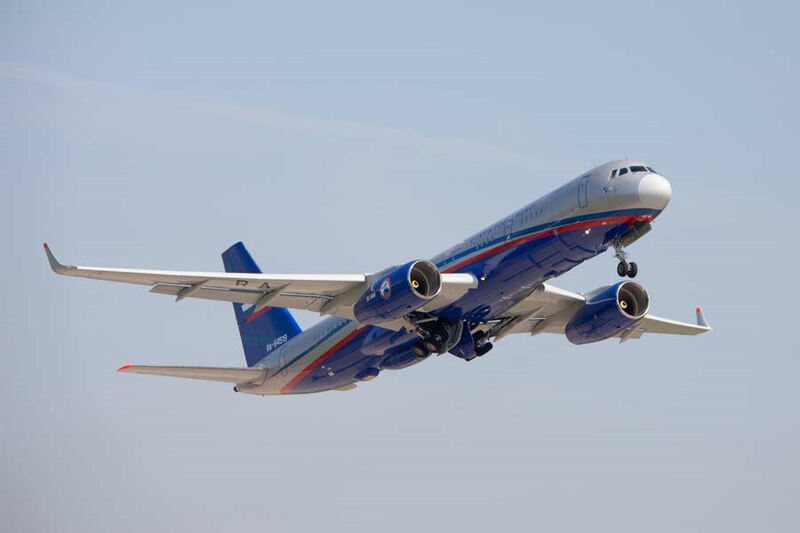 Adopting the Tu-214ON performed an important public task of surveillance in the framework of existing international agreements, it will allow to solve the most modern at present technological level. The novelty of the equippment is modern devices for aerial photography and other effective means of monitoring, and for the first time not only domestic. 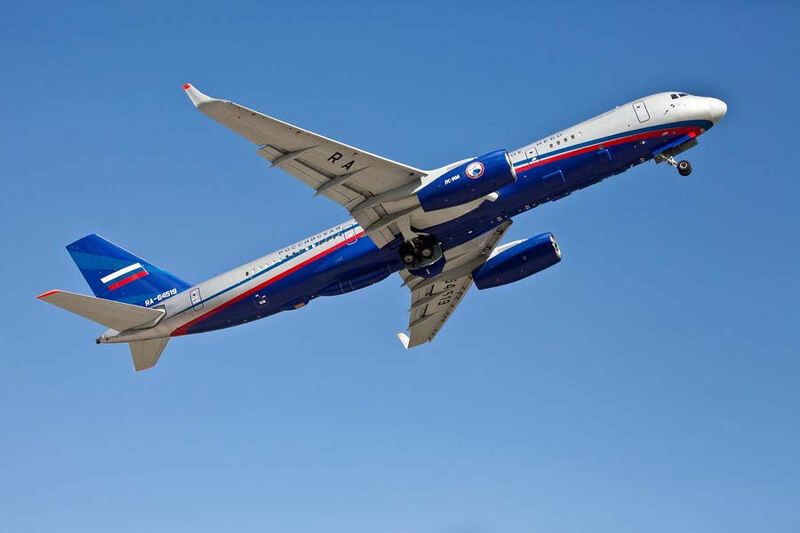 The Tu-214ON became the first domestic aircraft from which the restrictions were lifted on the use of foreign-made equipment in the composition of complex airborne surveillance. Mounted on an aircraft complex includes the entire range of permissible contract monitoring tools, equipment these devices for monitoring and control, as well as various equipment display and write all captured at the time of the observation flight information while preserving its a hard disk of the computer. 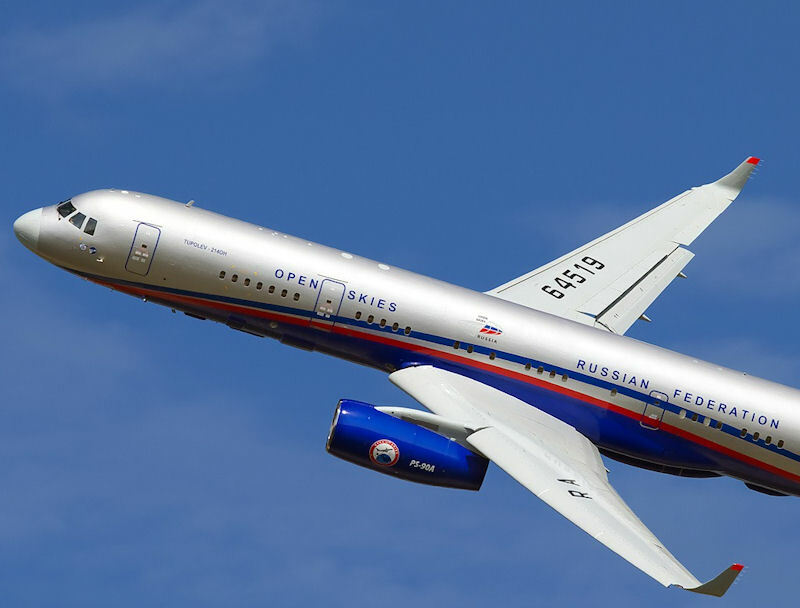 Digital video and photographic equipment are located in the lower compartment of the Tu-214ON who has special windows, closed shutters with motorized control. The structure of the set on the plane of the complex surveillance included three cameras, two side KTBO-6 and the central KTSH Wide-5. At this viewing angle KTSH-5 is 148 degrees, and the width of the scanning area is equal to - 6,6h. Angle KTBO-6 is from 8.5 degrees to focus in a narrow 20.1 degrees in a wide range of angles with the focus of sight and 60 degrees. In addition, TU-equipped 214ON board of computing complex, whose main task is to manage and control installed on board the means of observation, as well as to display the information in real-time on all means of observation and its recording. The structure of the aircraft ODCC included 5 fully automated workplaces (AWP), connected to each other via a local network. The crew of the Tu-214ON includes 5 people: crew commander, co-pilot, navigator, flight engineer, radio operator and translator. In addition, the cabin crew has an extra bed, which is intended for the controller from the observed side. The head of the mission, together with the head of the support group of the observed side are located in a separate cabin. Both have the ability to follow the work, installed on board equipment with the help of two remote displays, which are similar to those used by operators. All 5 workstations located in a special compartment of sensor operators. Each of these places has 2 monitors. One of the monitors shows the resulting image installed equipment on-line, and the second displays the information on the location of the aircraft, observation zone running at the time of equipment, map, information about flight conditions and other operational information. ARM also provides digital video recording and management equipment installed on board the observation. This work is complex operators controlled by representatives of the observed Party. All monitoring equipment is in two luggage compartments. In the front compartment are aerial cameras and video cameras in the rear compartment located side-looking radar with synthetic aperture, a special navigation system, as well as infrared observation equipment. Immediately beneath the plane itself is a radar antenna which is protected by means radome. On board there is a developed life-support system, which includes a kitchen, toilets and compartments for recreation relief crew. Total on board the aircraft at the time of the observation flight may be 31 people (members of the mission and the support group), the transit flight, the Tu-214ON can take 56 people. The first Tu-214ON public was demonstrated at the international air show MAKS-2011. The very appearance of Russian Tu-214ON received a great response. During the air show aircraft we visited and gave it high marks the representatives of Italy, Norway, Canada, the United States. The main operator of the Tu-214ON become the Defense Ministry. 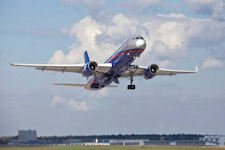 The Russians scheduled nine observation over-flights in 2013 that were set to begin in late March or early April. AF/A5XP, Strategic Plans, Policy Division and the Defense Threat Reduction Agency anticipated Open Skies missions to increase between from nine 21 passive missions per calendar year once the Russian Tu-214 became certified.